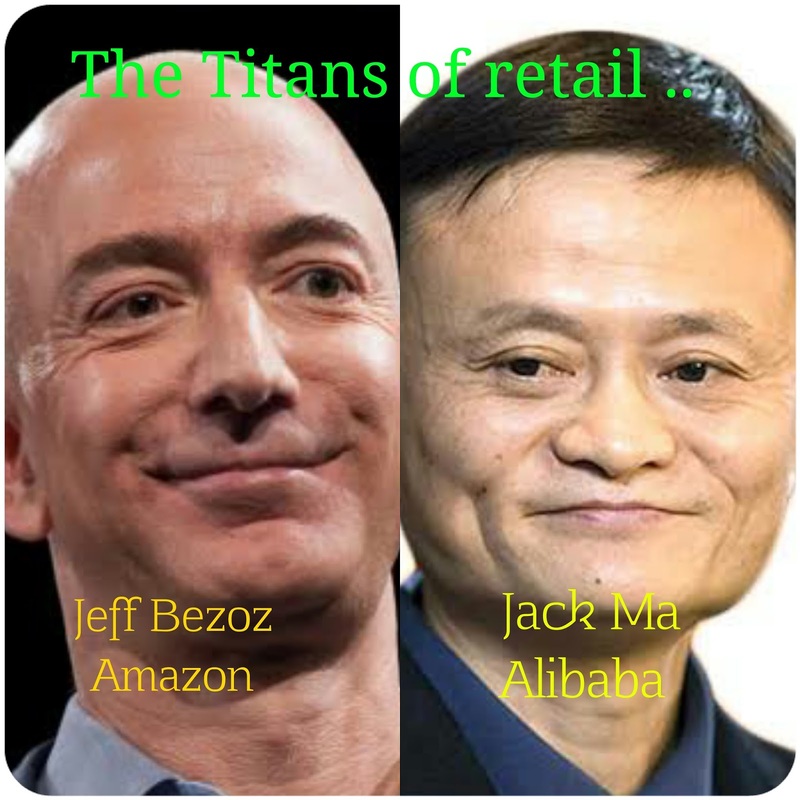 Musings 'n scribblings of a philanthrope .. : What gets Jack and Bezos, the Titans of retail, do great things ? What gets Jack and Bezos, the Titans of retail, do great things ? Retail - The sale of goods to the public in relatively small quantities for use or consumption rather than for resale. In the Indian context B2B is wholesale and only B2C is considered retail. Retail has caught up all over the world of late primarily because of the following reasons. The global retail sector is estimated to have achieved revenues of US$ 22.6 trillion in 2015 and should continue to rise to US$ 28 trillion by 2019, with average annual growth rate of 3.8% since 2008. The sector represents 31% of the world's GDP and employs billions of people throughout the globe. Two individuals lead the world in this retail revolution. Jack Ma from China leads Alibaba ($485.6 billion, 2016) and Jeff Bezos from US leads Amazon. ($136 billion, 2016). Though Alibaba is approximately 3.6x Amazon, Jeff Bezos of Amazon over the years has accumulated enough wealth and stock in his company to be designated as the richest person on planet earth with an estimated life savings of $ $118.8 billion dollars while Jack Ma leading an organisation Aliababa, 3.8x of Amazon, is worth just $40.1 billion. Entrepreneurs around the world have always marveled at how these individuals have crafted their success story. Watch this video of Jack Ma at WEF 2018 at Davos. He says he always tries to find and employ smarter people than himself. Why ? Because they know the technology, trends and future growth patterns much more than anyone. Ma says upto age 30 on has to make mistakes and study, 30 to 40 engage in business and make mistakes and learn, from 40 - 50, consolidate, from 50 - 60, handhold juniors and youngsters. As per Ma, after 60, everybody should relax and enjoy life ..
Amazon's CEO, Jeff Bezos Shared His 3-Step Formula for Success. Click here for Jeff Bezos's formula for success..
Do you notice similarity in approach of the two great retail Titans, Jack and Bezos ?? 2. the right attitude to work and challenges ..
Retail industry is nothing but getting the right thing to the right person in the right form at the right place and time through the right mode at the right cost and in good safe condition. Retail industry as we know is both labour and technology intensive, with each complementing the other strongly. As technology develops and matures, only smart people with the right attitude can change and reorient themselves to the challenges. Considering the growth and expansion in retail @ 3.8 % globally, it has to be seen how much the retail sector would grow now in India and other developed and developing countries of the world.